Grilling: It’s the traditional pastime of Summer in America. Get your propane fuel ready or the charcoal warmed up, then toss on some meat and kick back while the food sizzles. It works because meat is cheap. We can thank industrial agriculture for that. (Briefly, subsidized corn makes for cheap livestock feed). I try to avoid industrially-produced meat, isntead opting for veggies when eating out. At home, the meat I consume comes from local farms (purchased at farmer’s markets and food co-ops). Though organic is a nice bonus, my main concern is that the livestock was treated humanely. This means giving a pig a chance to be a pig, and a cow the opportunity to do cow stuff. The meat from humanely-treated animals ends up being considerably different from the meat of animals from conventional farms. I think it tastes better. Research suggests it’s healthier for you. Certainly, it takes more out of my wallet, but that also means I buy it less frequently and therefore eat meat less often (not a bad thing). My favorite real food hot dog is an Applegate Farms product called, “The Great Organic Uncured Hot Dog.” An 8-pack will run you $6 to $9, depending on where you buy it and whether or not there’s a sale taking place. 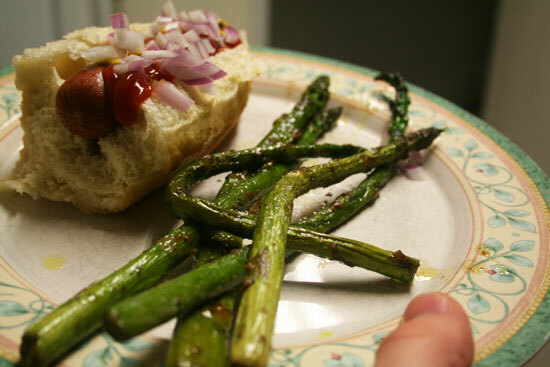 The last Eating Real Food experience with these organic hot dogs was last year, when I prepared The Great Salad Dog. This time, I wasn’t so experimental. This dog is loaded with ketchup (organic), mustard (organic), and diced red onion. Freshly picked and in-season asparagus was served on the side. 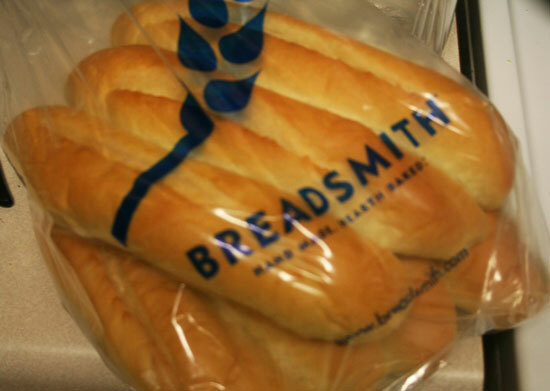 The buns, from Breadsmith, were HUGE! One bun could accommodate two hot dogs, so those were cut in half. This Summer meal wouldn’t be complete without a good brew. 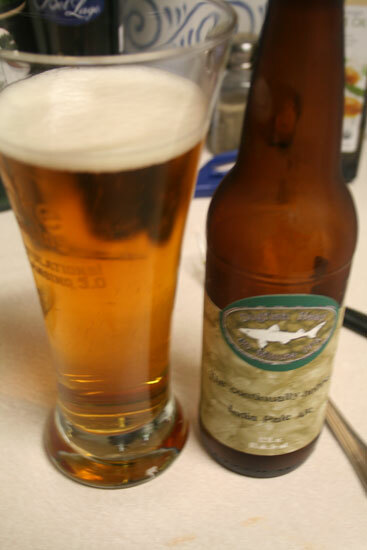 I washed it down with some 60-Minute IPA from Dogfish Head. The immediate difference between this hot dog and other hot dogs is that this one has substance. You can’t ignore it while focusing on the bun and toppings; you really have to eat this thing.